Momentum Pictures has release the comedy film FUN MOM DINNER in select theaters and on VOD and if your into female focused films, I recommend you see it. And not just because I had a chance to interview the all female cast along with the Director, Writer and Producer. Note: I was invited as media to the movie screening and press junket interviews. However any personal views expressed are always 100% my own. After screening the film, I couldn't wait to speak to the ladies. 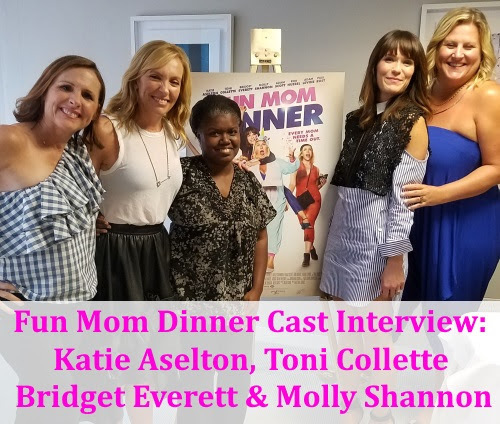 So I headed over to the The London Hotel for a intimate meet and greet with FUN MOM DINNER film stars Katie Aselton, Toni Collette, Bridget Everett, and Molly Shannon to hear what they had to say about their roles. Onica (MommyFactor}: If you had to give one piece of advice to moms dealing with some of the topics you dealt with in the movie, what would it be? Toni Collette: I think women wear so many hats, and I think they need to give themselves a break and not feel that they have to be perfect all the time. The amount of guilt that most mothers have that I speak to, the guilt is rife. And it's really unfair that we do it to ourselves. I think we can probably let go of that. It's not healthy. Katie Aselton: Shake the pressure to be that women that everyone looks at and says, "How does she do it?" I feel like we do that to ourselves a lot. And you can't do everything all at the same time. It's okay. It makes you a more accessible, more human human to say it's okay, I'm going to fail sometimes. I'm going to fall a little short, but that doesn't mean I'm a bad mom or a bad wife or a bad friend. It just means I can't ace it all of the time. Molly Shannon: I read this amazing book called Perfect Madness: Motherhood in the Age of Anxiety. It's fantastic. But basically it's about how women can be really hard on other women. And there's women who work, women who don't work, and there's a lot of insecurity about these choices. And they're not taking it out on men, but the women can take it out on one another. But, it was just such an excellent book that I loved. And it talks a lot about how we've almost gone back to the '50s with this idea of attachment parenting and and it's made women so much harder on themselves, like you were saying, trying to be perfectionists. So, yes, I would say it's important to take care of yourself and give yourself a break, like Toni was saying, and do nice things for yourself, because then you can go back and be a better mother because you have balance. Bridget Everett: Well, I don't have kids. I have a dog. Poppy Baby. I don't believe in giving unsolicited advice. That would probably be my advice, to not give unsolicited advice. But I also say I like to take lots of time to show my appreciation and love for my little girl with scritchy-scratches and tummy rubs. I let her know every day what she means to me. Didn't the women give us great advice?! Really it seems simple but really putting such simple advice into action can make such a world of different for women (parents or not) everywhere. We need to be reminded it's OK not to be perfect, to stop and take time for ourselves and to tell each other how much we appreciate each other instead of nagging each other! 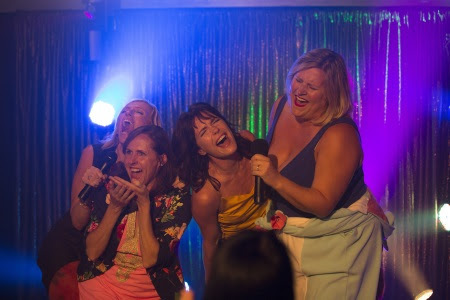 Thank you to Momentum Pictures and Katie Aselton, Toni Collette, Bridget Everett, and Molly Shannon for making a fun movie women (parents or not) can take time out to enjoy. Hopefully together! Make sure to take the "Fun Mom Dinner Quiz" and find out which type of #FunMomDinner mom you are! Four moms whose only common ground is their kids' preschool class, decide to get together for a harmless "fun mom dinner." The night begins as a disaster, but the combination of alcohol, karaoke, and a cute bartender, leads to an unforgettable night where these seemingly different women realize they have more in common than motherhood and men. The film is executive produced by Adam Scott and Paul Rudd, and produced by Naomi Scott, Andrew Duncan and Alex Saks.